Habit: [Perennial herb] subshrub [shrub]; taproot stout. Stem: erect to trailing, twig hairs stellate or 0. Leaf: ovate-obovate, unlobed, serrate. Inflorescence: flowers 1(2) in leaf axils. 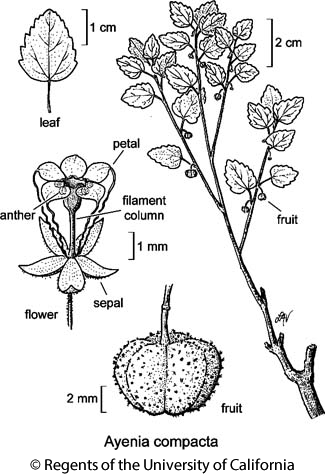 Flower: generally < 3 mm wide; sepals +- spreading, narrowly ovate; petal claw thread-like, coiled, limb +- obcordate, incurved, parachute-like, sinus with an anther below and a stalked, gland-like appendage above; filament tube +- cup- or urn-shaped at top, surrounding ovary, with 5 short, stalked anthers bent out- and downward (each stalk inserted in sinus, thereby attached to petal), staminodes 5, < stamens; ovary (and fruit) stalked above receptacle. Fruit: capsule, chambers 1-seeded. Habit: Plant 1--4 dm, much-branched at base. Leaf: stipules small, brown. Flower: sepals +- 1.5 mm; petals 2--3 mm, claws +- 2 mm. Fruit: +- 5 mm, spheric, straw-colored, with +- cylindric, +- purple protuberances. Seed: black. Citation for this treatment: Robert E. Preston, R. David Whetstone & T.A. Atkinson 2012, Ayenia compacta, in Jepson Flora Project (eds.) Jepson eFlora, http://ucjeps.berkeley.edu/eflora/eflora_display.php?tid=15350, accessed on April 20, 2019. PR (desert slope), e&s DMoj (rare), w&c DSon; Markers link to CCH specimen records. Yellow markers indicate records that may provide evidence for eFlora range revision or may have georeferencing or identification issues. Purple markers indicate specimens collected from a garden, greenhouse, or other non-wild location.